A partial view of the lenga's forest taken from the base of Perito Moreno glacier in 2008 in Patagonia, Argentina. 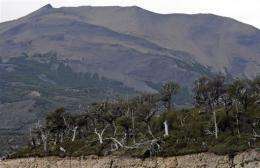 Argentina has lost nearly 70 percent of its forests in a century, the Environmental Secretariat said at a UN conference on desertification. Argentina has lost nearly 70 percent of its forests in a century, the Environmental Secretariat said at a UN conference on desertification. "In 100 years, we have lost between 60 and 70 percent of our forest heritage," Environmental Undersecretary Sergio La Rocca told reporters on Friday. The UBA study found that in 2007, "the highest rate was reached: 2.1 percent of forests destroyed in a single year." The move ran counter to the provincial authorities, which had authorized forest exploitation. La Rocca spoke at the ninth session of the conference of parties to the United Nations Convention to Combat Desertification (UNCDD) in Buenos Aires. The scourge of desertification directly affects 200 million people, according to UN figures. Buenos Aires will host the 23rd World Forestry Congress October 18-23, a forum where governments, civil society and the private sector exchange views to formulate forestry policy.